He was the one with the idea. He took over the kitchen one Sunday afternoon, he cleaned, he chopped, he weighed, he cooked, he jotted down ingredients and make some notes. 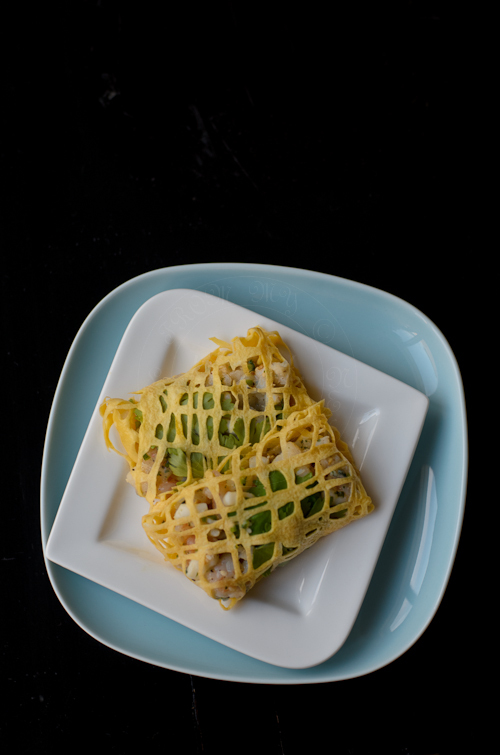 ... and of course to photograph his 'Fishnet parcels Masterpiece'. This is how we spend our weekends, if we are not busy running, driving, waiting, planning our schedule around kids' social calender (which happen to be quite full!!!). Pat dry seafood mix with kitchen paper and coarsely chopped. Wash and separate coriander leaves from stems. Heat oil in pan and sauté garlic in medium heat. Increase heat and add seafood mix, palm sugar, chilies, fish sauce and pepper. Give it a quick stir for 1 minute or until seafood is cooked through. Remove from heat and add in chopped coriander stems and sesame seeds. Lightly grease a non stick frying pan (30cm size is used here) over medium heat. Using an icing piping bag, cut off a small hole (smaller hole is manageable, test it out prior to making the net). Use a bag clip and clip the bottom or the snipped end to stop eggs from flowing. When pan is hot, gently squeeze the bag. Using a zigzag motion, forming a line horizontally and vertically over the hot pan. Try to keep to 10cm by 10cm size. Once the egg set, slowly remove the egg from pan onto plate. Place a few of coriander leaves onto the centre of the fishnet. Spoon 3 teaspoon of seafood mix onto the coriander leaves. Sprinkle some golden fried shallots. Fold in the sides; left, right, top and bottom to enclose the filling and form a parcel. Serve as entrée with sweet chilli sauce or delicious to eat it on its own. Note to self: to try with cut up bird's eye chilli, when he makes this again. What a good idea, I never come across Roti Jala with filling. Well whoever idea it is, two thumbs up! I love the idea of fishnet...it sure turned out beautiful and looks very tasty...awesome idea! Hi Lisa, your fishnet banyak cantik ooooo... very appetizing snack. I love this. Wow, such a beautiful recipe and I love this idea! Very fancy and delicate! I'm in awe of this gorgeous dish, Lisa!